By the time I was finished with them -- and they with me -- my experience with the Tetra Live 405 loudspeakers seemed like an archeological dig in Giza, Egypt, complete with pyramids (which the Tetras visually resemble) and a sonic Mata Hari flitting in and out -- one part mystery, one part beauty. The Tetra beckons with a glossy cherrywood cabinet, complete with a black stripe down the middle to cover the 2" front-firing port. The head is in the shape of an equilateral triangle, which according to Tetra is difficult to fabricate. Its drivers comprise a 1" Morel treated-fabric tweeter and a 6" Morel NeoLin Neodymium Damped Polymer Composite woofer. The bulk of the Tetra is made of 0.75" medium-density fiberboard (MDF), and the entire speaker is 38" high, 16" wide, 16" deep, and weighs only 45 pounds. Petite and sensuous, the Tetra Live 405 gives the Wilson Audios and Sonus Fabers of the world stiff competition in the Speaker Beauty Pageant, all for only $5900/pair USD. According to the Tetra website, "thinking outside the box means designing around the inherent weakness of box speakers -- internal standing waves. The 405s enclosure, like all Tetra speakers, is expressly designed to eliminate them. Standing waves are out-of-phase acoustic energy that builds up at high sound pressure levels behind the drivers as they work. Unless controlled or eliminated, they can interfere with the forward-radiating sound. The results may be muddy, distorted, bright, grainy, or all of the above." Couldnt have said it better myself. However, the Live 405s cabinets didnt feel very inert: when I touched them, I could feel them vibrating, the front panels more than the sides. I hooked up the Tetra Live 405s to my reference system of First Sound Presence Deluxe II preamp, ASL Hurricane DT power amps, Njoe Tjoeb Super 4000 and JVC XL-Z1050 CD players, and Nordost Valhalla and Valkyrja wires throughout. Late in the review arrived a Nottingham Horizon turntable, Origin Live Silver tonearm, Clearaudio Signature phono cartridge, and Tom Evans Microgroove Plus phono preamp. ASC Tube Traps litter my listening room, which is carpeted in wool and measures 9 x 13 x 20. I first set up the Live 405s 65" from the front wall, but ended up with them 80" from that wall -- a third of the room length -- as this increased the soundstage depth and removed the sense that the instruments were all lined up behind each other like tourists waiting for the next tour of the pyramids. What I noticed right away was the Live 405s soft bass. On Legend: The Best of Bob Marley [Tuff Gong 314 548 902-2], the bass lacked impact. This CD is hardly the epitome of good engineering, but its bass is reasonably tight, which is why I used it. Its an easy test: Does the bass remain firm while not becoming solid-state tight, which is not how this disc sounds? It did not. This softish bass was evident on all the music I played through the Live 405s, including Center Stage [CD, Wilson Audio WCD-8824], which has an immense, tightly tuned bass drum that shook my old listening room in San Francisco every time I played it. This was also true with Fiesta [CD, Reference RR-38CD] and Stravinskys Firebird [CD, Mercury Living Presence 434-012-2], and became somewhat distracting. It was akin to walking across a springy surface such as a deep carpet, rather than a concrete slab. The problem haunted me for months. But there was a Cinderella ending . . . Even with its bass going all SpongeBob SquarePants on me, the Live 405s midrange was enchanting. The Tetra presented music in a way that was intensely compelling. Bob Marleys "Could You Be Loved" asks if the listener can allow him- or herself to be loved. Marleys emotional delivery came through easily along with the Jamaican rhythms, which, given the bass issues, slowed the pace somewhat. That aside -- it was possible to become involved in the emotion despite the soft bass -- the 405s delivered the goods. In order to assess the Live 405s reproduction of well-recorded male voice, I used a Bill Morrissey cut from TAG McLaren Test Tracks [CD, TAG McLaren 4101], "Youll Never Get to Heaven." This is a spare, closely miked song with electric guitar and percussion in the background. Morrisseys pained, sardonic vocals are quite affecting; again, there was no doubt of the emotion being conveyed. I then listened to a recording of Verdis La Traviata, with Anna Moffo and Richard Tucker [CD, RCA Living Stereo 68885-2]. The 405s delivered a beautiful presentation; the voices of Moffo, Tucker, et al. were particularly mesmerizing. I am not an opera devotee. I bought this set to see how the Tetras could handle music with great dynamic range. I expected my own subjective response to be measured, but I got much more than Id bargained for. In "Sempre Libera," when Alfredo sings to Violetta from offstage, his vocal inflections and dynamic contrasts pulled me into the music more than Id thought possible. Moffos trills are splendidly executed, according to my opera-singer friend Bob. (Bob can be critical to the point of exasperation; when a speaker system reproduces these details to his satisfaction, its cookin.) Given a sufficiently powerful amplifier for the "big moments," the Tetras could convey the full scope of operas drama and emotion. James Judd and the Florida Philharmonics performance of Mahlers Symphony No.1 is a gorgeous recording [CD, Harmonia Mundi HMU 907118]. In the third movement, with its famous variations on "Frère Jacques," the violins are beautiful, focused, and poignant in their speech. When the flute enters at about six minutes into the movement, I could hear the air around the instrument. In fact, particularly in the midrange, the Tetras impressive re-creation of musical instruments physical materials led to a convincingly three-dimensional presentation. The inner details of the flute came through as clearly woody. Violins sounded like wood and bow together, not just the bow itself. This effect worked best with smaller ensembles, such as jazz trios. When masses of instrumental choirs played simultaneously, the Tetras, while retaining the musics gestalt, did not quite maintain the sense of individual instruments sitting side by side. Instruments played forte and louder sounded a bit congealed in contrast to many individuals playing together in unison. Listen to any track of Antal Doratis recording of Stravinskys Firebird on Mercury Living Presence to hear a beautiful swell of strings but without all the weight and individuality. There was also a slight loss of intertransient silence -- the silences between notes. The Tetras managed the magic of resembling a live microphone feed from the Metropolitan Opera on a Saturday afternoon, something my Wilson Audio WATT/Puppy 1-3s could not quite manage. Not only did I hear this magic with the combo of First Sound Presence Deluxe II preamp and ASL Hurricane DT power amps, but the 405s sounded quite good with as simple a setup as an Arcam A65 Plus integrated amp, lacking only the three-dimensional effect and some room ambience. I still wished that the Live 405s sound had a bit more weight -- more density. While the Live 405s three-dimensional effect was terrific, especially with Transparent Audio interconnects, I still wished for a more solid presentation. The Tetras richness of tonal colors in the upper frequencies was dreamy. A triangle can sound very washed-out and "whitish" through some speakers and systems, like a silver shirt faded from constant washings. The Tetra-Hurricane combo displayed no fading effect. With the Arcam integrated there was a bit less color to the sound, the triangle sounding a bit washed out. Occasionally with both amps, however, there was a definite edge on the transients of triangles or glockenspiels, also noticeable in the upper midrange. Brass instruments displayed edge when blown hard. On track 9 of Stereophiles Test CD 2, which features trumpets, horn, trombone, tuba, and percussion, the tonality was fine, but there remained the slightest sense of edge in the upper-midrange/lower-treble region. This will depend to some extent on recordings, but even James Judds Mahler 1 CD, an utterly smooth recording, displayed this trait. Using a speaker cable with a softened effect in this range might smooth out the edge, but might also mute the musics dynamics and therefore its excitement. I wonder if asking the Live 405s midrange/woofer driver to reproduce six octaves might not be the problem here. Meanwhile, a clue to resolving the mystery of the soft bass was inadvertently provided by Tetras PR representative, Jonathan Scull. The Tetras had been delivered without so much as a spec sheet. It couldnt have been lost in the box; like some poor soul interred in a pyramid for crimes against the Pharaoh, the box is only big enough to hold the speaker itself. Secret compartments? No room for mysteries or secrets inside the Tetra pyramid. When I inquired -- several times -- about the arrival of the sacred scroll (owners manual to you), Scull suggested that perhaps it had been removed during a customs inspection. I wondered what else Customs might have moved -- or loosened. Drivers, maybe? Armed with an Allen wrench, I approached the Tetras. Inserted wrench. Turned wrench. Immediately, as if conjured by the twins of cosmic coincidence, I discovered several loose driver screws. The speakers, Id been told, were brand new, unheard by human -- or even reviewers -- ears. Id assumed that all the screws would be tight. I assumed wrong. Assumptions and loose screws quickly dispatched, I returned to the music. The bass mush had been de-mushed, which had the additional effect of illuminating the upper-bass/lower-midrange frequencies, which previously had sounded hollow and dynamically inarticulate. In the fourth movement of the Mahler Symphony 1, the bass drum jumps into the room like a tomb raider into a pharaohs crypt. Still, the bass authority below 80Hz could have been stronger. Even with the Hurricanes -- no slouches in the midbass -- the Live 405s clearly diminished the musics weight and responsiveness, even up into the upper bass, where small drums demonstrate less micro/macrodynamic fervor. Net effect? The bass dynamics didnt jump as they do in life. Bass weight and dynamics were certainly present -- just not as powerfully as Ive heard from my reference recordings through other speakers. Listening through the Tetras to Classic Records vinyl reissue of Bizets Carmen [CD, RCA Living Stereo/Classic LSC-2449], I found myself positively giddy at how beautiful it sounded. I listened to the whole side, seduced by the sheer gorgeousness and immediacy of music through the Live 405s. Only the slightly premature decays of overtones and the lack of low-level liquidity suggested any room for improvement. But the sense of space remained -- my listening room seemed to disappear as I seemed to be watching and listening from a first-tier seat. As sonic illusionists go, the Tetra Live 405s were persuasive showmen. When I switched in and out different CD players, interconnects, speaker cables -- even plug polarities -- the Tetras clearly revealed the changes. 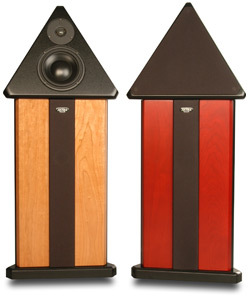 While weighted on the yin side of things, they held their own in comparison to more yang-sounding transducers such as the Alón Elite Plus ($4500). A squeaking chair in the RCA Living Stereo Carmen sounded more constipated through the Tetras than through the Alóns, which floated it as easily as a bubble. The Alóns also gave a greater sense of seeing into the recording venue, were more evenly lit by the sonic light over the orchestra, and were lower in apparent distortion -- but the Alóns also sound more lean, tonally. The Tetras had a clearly richer, more varied palette of colors that was, for my money, truer to life. Some might see the Alóns as more neutral, but to me they consistently lacked tonal richness. Between the Metropolitan Opera, Carnegie Hall, and Connecticut Grand Opera performances at the Palace in Connecticut, the music I regularly hear validates both speakers. Until the Tetras, I was satisfied with the Alóns lighter colors. Now I am a changed man. I can only imagine what the Tetras would be like with a ne plus ultra source player such as those from Mark Levinson or Esoteric. The Tetra Live 405 is the speaker for those who worship rich tonal colors, the human voice, and/or classical, opera, and jazz. It is coherent from top to bottom. The soundstaging is terrific, the imaging great, and my review pair consistently made beautiful music. Well set up, and aside from the aforementioned shortcomings -- every speaker has at least one -- the Tetra should be able to effortlessly delight you. Price: $5900 USD per pair.